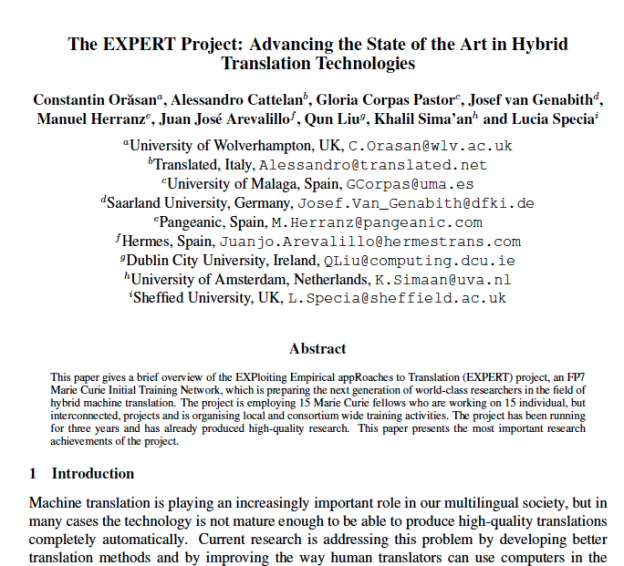 The paper “EXPERT Project: Advancing the State of the Art in Hybrid Translation Technologies” has been published in the Proceedings of the Translating and the Computer 37 Conference. 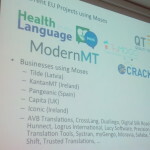 Pangeanic’s role in the Project consortium is as industry expert in statistical machine translation (SMT) and hybrid machine translation as a developer of the PangeaMT system with particular reference to bilingual resource building and leverage for automated engine creation and updating as well as machine translation. requirement analysis, as well as for the evaluation of the prototypes developed in EXPERT. 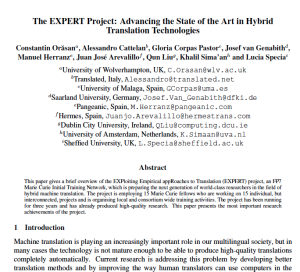 This paper provides an overview of the EXPloiting Empirical appRoaches to Translation (EXPERT) project, an FP7 Marie Curie Initial Training Network, which is preparing the next generation of world-class researchers in the field of hybrid machine translation. Currently, the EXPERT project employs 15 Marie Curie fellows who are working on 15 individual, but interconnected, projects and is organizing local and consortium wide training activities. The project has been running now for three years and has already produced high-quality research. This paper presents the most important research achievements of the project. 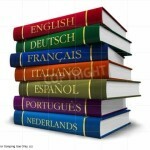 Pangeanic has a team of 8 translation consultants and development experts with long experience in the R&D of multilingual, automated, translation technologies, language development and its deployment in production environments, as well as 2 senior software developers focusing on scalable, web-service based machine translation architectures, user interfaces and deployment experiences. The Post-Doctorate fellows from the EXPERT project have access to Pangeanic’s hardware and software resources for the development of language building tools, the translation system and platform as well as the optimisation of the hybridisation performance. During the project, Pangeanic provides unlimited access to its entire computing infrastructure to serve the project with its massive amounts of data repositories as well as its statistical language models, automated PangeaMT platform which features automated re-training features, etc. 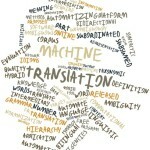 PhD students visiting Pangeanic for a secondment will gather an insightful view about a real-world multilingual content production environment that is also well-aware of and keen to foster and deploy advanced translation technologies. 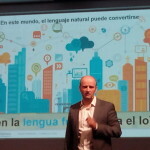 How many words does a professional translator translate per day?